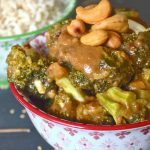 Tender broccoli smothered in a rich, thick Asian style sauce. Insanely simple to make, ready in less than 30 minutes and full of flavour. Add all of the other ingredients to an oven proof dish and whisk together. It will look a bit lumpy but thats fine. Add the broccoli and stir well to coat in the sauce. Cover the dish and bake for about 20 minutes until the broccoli is tender (test with a fork) and the sauce has thickened.